Back in the 1960′s and 1970′s the late Jim Henson and his associate Jerry Juhl wrote many interesting screenplays for development as projects for The Muppets, and many of them were never produced. 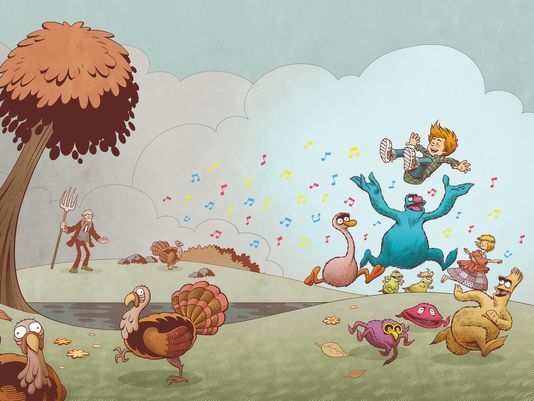 Among the latter was a story called The Musical Monsters of Turkey Hollow, which went like this: “Turkey Hollow is a picturesque town where hundreds of years ago, unbeknownst to the citizens, a meteorite landed nearby a small brook on the outskirts of town. One Thanksgiving, while young Timmy Henderson practices his guitar, he’s accompanied by strange, unearthly, musical sounds. That meteorite wasn’t a rock at all but an egg holding seven furry, goofy monsters, each with a unique musical sound. After the initial shock, Timmy befriends the lovable creatures following him all around Turkey Hollow. Not everyone takes a liking to the visitors though and it’s up to Timmy to protect his new friends and save Thanksgiving!” Now Archaia Comics have partnered once again with illustrator Roger Langridge (Snarked, The Muppet Show) to bring these Musical Monsters to life in a brand new full-color graphic novel coming in hardcover this October. What’s more, according to an article in USA Today, Lisa Henson (Jim’s daughter and CEO of Henson Company) has confirmed that the original script is being developed into a holiday TV special — possibly for release as early as this Thanksgiving!